I have two layouts to share from Retreat featuring Kaisercraft's Up Up and Away range. I loved the colours in this range as soon as I saw them. Great for outdoors and boy pages. I love this diecut paper so cute. Photo is of Matt with the only thing we caught at Sheba Dam - weeds. The second page is of my ever colourful Ben. The background paper has a lovely embossed texture. 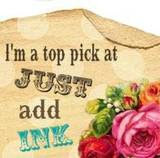 I have used Stampin' Up! 's Pinking Hearts border punch on the rust paper. Cute huh! Okay off to Oz-tag now with Matty..it is so cute. He scored a try last week too.